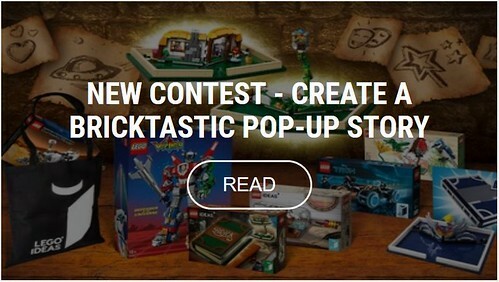 With the release of the new Pop Up Book set comes another contest on LEGO Ideas: Create a Bricktastic Pop-Up Story. "Do you consider yourself an amazing storyteller? Whether you’re into action stories, romance, fairy tales, science fiction, comics or a whole other genre, we now challenge you to build a bricktastic story that will make us all fall off our chairs! To give your story the ultimate twist of creativity, we ask you to build it as a pop-up. So, get ready, fetch your bricks, and surprise us with some awesome pop-up stories!" Open through January 3rd, 2019 at 6:00 a.m. EST. the contest comes with the usual array of superb prizes. The Grand Prize winner will receive: A custom, special edition Pop-Up Book trophy created by LEGO Designer Wes Talbott and featuring artwork by LEGO Graphic Designer Crystal Fontan, A 8x16 tile signed by the LEGO Ideas team, The complete 2018 LEGO Ideas assortment: 21315 Pop-Up Book signed by the LEGO Designer, 21311 Voltron signed by the LEGO Designer, 21313 Ship in a Bottle signed by the LEGO Designer, 21314 Tron Legacy signed by the LEGO Designer, 21104 NASA Mars Science Laboratory Curiosity Rover, 21301 Birds, LEGO Ideas tote bag, LEGO FanTube interview opportunity. Two Runner-Up winners will each receive: A custom, special edition Pop-Up Book trophy created by LEGO Designer Wes Talbott and featuring artwork by LEGO Graphic Designer Crystal Fontan, 21315 Pop-Up Book signed by the LEGO Designer, 21313 Ship in a Bottle signed by the LEGO Designer, 21110 Research Institute, 21109 Exo Suit, LEGO Ideas tote bag. Find the full rules and details on the contest page.